Quidditch is a full-contact sport. Within fifteen seconds of the opening whistle at Loyola University’s championship match, an athlete had already landed face first in the dirt; at the semifinals the night before, one player had to be taken away in an ambulance. 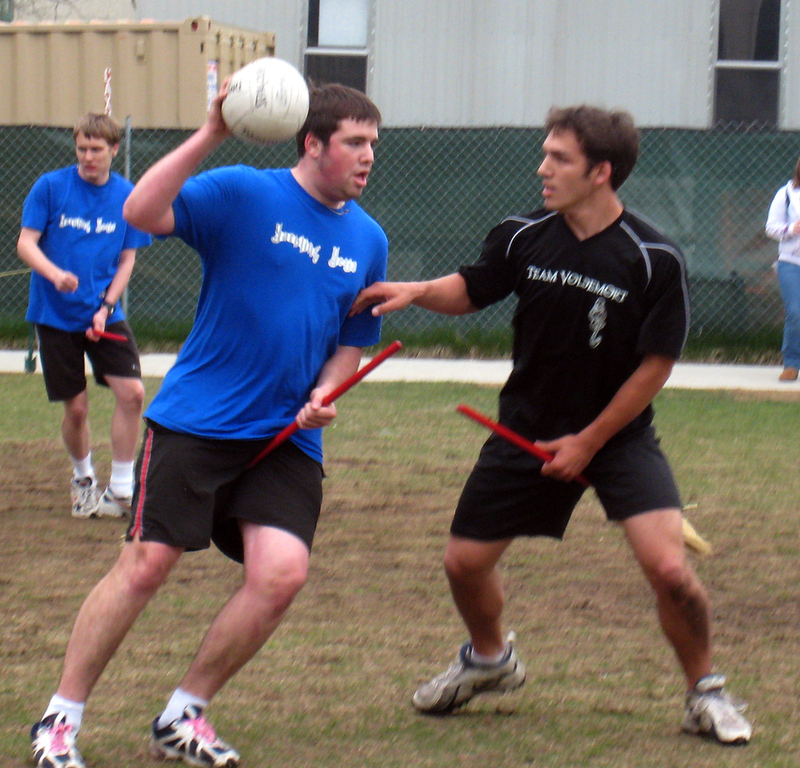 “It’s basically rugby with brooms, ” says Bohrs Hoff, a Loyola senior and Quidditch fan. In J.K. Rowling’s “Harry Potter” universe, in which wizarding Britain has the same relationship with Quidditch as Texas has with football, the brooms are for flying on. In this world, they serve as bristling phallic symbols of intimidation. For a made-up game based on a children’s fantasy series, Quidditch is surprisingly badass. 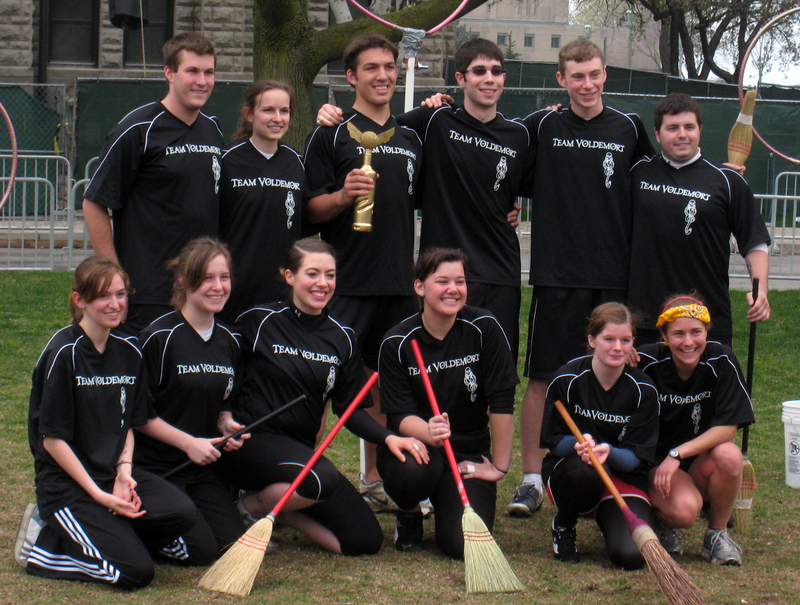 The championship match between the Yarbling Yetis and Team Voldemort marks the triumphant end of Loyola’s first Quidditch season. Though the group is not recognized by the university, enough students play to make up five teams, the biggest of which has sixteen players. They join dozens of other college groups who play a version of the sport adapted from the Potter books and movies. More than sixty spectators have gathered on this wet afternoon to watch the game, and the Yetis are heavily favored. Their cheering section makes a noise between a yodel and a gurgle, presumably the yarble. Kelly Paterson, a Quidditch fan although, she says, she’s “never read the book,” explains the rules. Just as in soccer, each team has a goal and a goalie, called a Keeper. Each goal is made of three hula hoops mounted seven feet in the air on poles. Three players called Chasers pass the Quaffle, a half-deflated soccer ball, and throw it through any hoop to score ten points. Their opponents may tackle them to gain the Quaffle. The Chasers must also watch out for Bludgers, dodgeballs thrown by the enemy team that force a Quaffle-drop on impact. All the while, a cross-country recruit is sprinting across campus as the Golden Snitch, whose capture by a Seeker will end the game and bring home thirty points. Suddenly three whistles cut through the noise, and the players pause. Many fans are already moaning in disappointment before the victorious Team Voldemort Seeker enters, waving the Snitch’s bright yellow bandanna over her head. Her success catapults Team Voldemort ten points ahead and ends the match after only twenty minutes. Team Voldemort captain Nick Mathews beams as he accepts the Loyola Cup, a winged tennis ball on a gilt pedestal. Despite the snakelike Dark Mark traced on his forearm, he insists that he’s in it just for the game. Quidditch is intensely athletic, and he believes it will attract players from sports like rugby and lacrosse. “Everyone’s loving Quidditch,” agrees Evan Fazio, the Snitch, gulping water from a bottle. His run ended after a protracted cat-and-mouse game with the Team Voldemort Seeker, who took him down with a tackle after spotting him in some bushes. Even though he’s not part of any one Quidditch team, Fazio says he feels an obligation to the fans to evade the Seekers so that the game goes on.